Inspired by Donella Meadows’ hierarchy of leverage points to intervene in a complex system, reSTORY seeks to work at the point of highest leverage; the paradigm out of which our culture arises. The goal of the reSTORY Alliance is to contribute to shifting the paradigm on which our society is based to one that yields a more compassionate, bio-diverse and regenerative world. Purely issue-based communications have a limited ability to reach and move people, and there seems to be an endless stream of issues to be addressed. 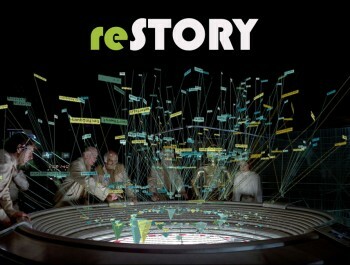 ReStory attempts to address the shortcomings of the un-contextualized, siloed, issue-based communications. ReSTORY drops down a level to grasp and map the menu of cultural assumptions that are at the root of nearly all issues we currently face. Oriented within the illuminated landscape of predominantly unspoken and unacknowledged assumptions, the “reSTORY activist” is radically empowered, armed with unprecedented context and perspective.